Polish-Russian-American cellist Ignacy Gaydamovich, is the winner of the Allegro-Vivo competition in Austria and recipient of top prizes at other competitions. As a soloist he performed with the National Radio and TV Orchestra of Albania, Hartt Symphony Orchestra, and Manchester Symphony Orchestra. He released two CDs, and gave over one hundred recitals in Europe, Middle East, Asia, as well as South and North Americas. In the US, he served as a Visiting Assistant Professor at the Crane School of Music and has been on the cello faculty at Texas Christian University and Mount Holyoke College. Most recently he was invited by Nikolai Lugansky to perform at the Rachmaninov’s house in Russia. Dr. Gaydamovich has received degrees from F. Chopin Music Academy, Texas Christian University, Boston Conservatory, Longy School of Music, and the doctorate from the University of Hartford. 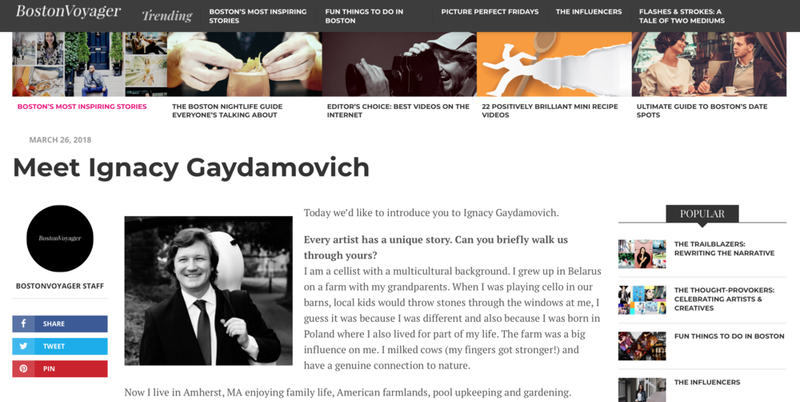 He is represented globally by the Neyman Arts agency.